Fire ecologists say it will take decades for forests to recover from the Rim Fire in Yosemite National Park, given the extent of the high-severity burn. Now they’re adding another concern to that list: California’s dry weather. 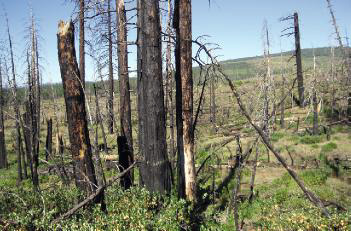 The sprawling stands of dead trees, an estimated 40 percent of the burned area, are reminiscent of another major national park fire: Yellowstone in 1998. 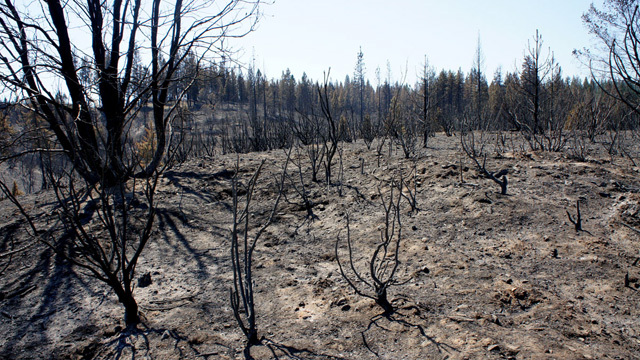 Mid-elevation forests, like the area of the Rim Fire, have historically seen frequent, low-intensity fires where most of the large trees survive and seed the next generation. “You need to have live trees nearby an area for the seed to be blown in on the wind,” North says. That could be a challenge in the Rim Fire’s largest swath of dead trees, estimated to be 63,000 acres. “It’s very unlikely that seed is going to be able to get into the interior of that high-severity patch,” says North. 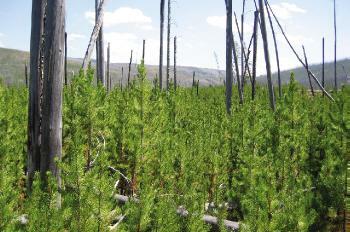 Even when young trees get established, drought could hamper the recovery, as North and other fire ecologists published in the journal Science on Thursday. It’s been a record-dry year in California so far, something that could aid shrubs and bushes - the quick-colonizers that could potentially take over historically forested areas. The Forest Service is currently considering whether to plant trees in badly-burned areas to give shrubs some competition and the forest a head start.